January Journal: Day 4 — Ginger writes. We've been using cloth napkins for years. I think it started when I found some pretty napkins on clearance at Anthropologie. We eventually ended up with four different sets of cloth napkins from various places. 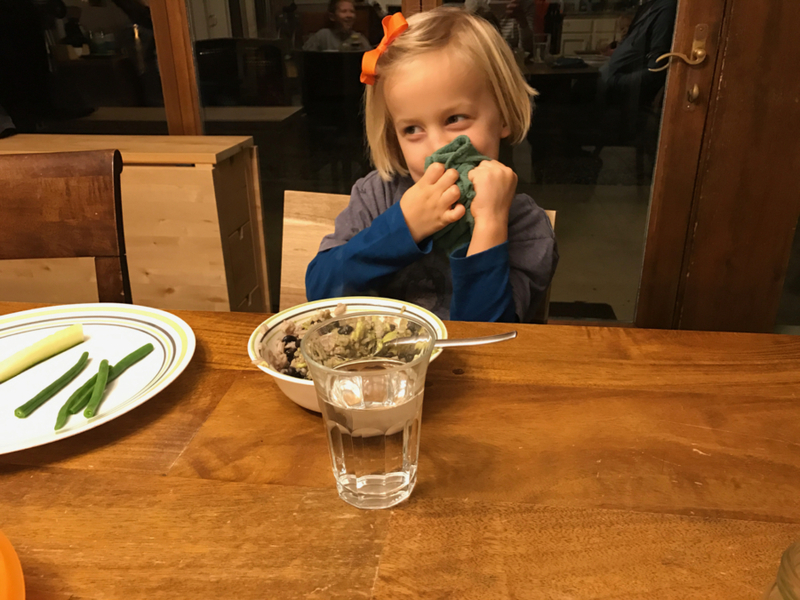 But with our growing family and the unhappy fact that things don't last forever (those Anthropologie napkins were the first to thin and shred, probably because they were my favorite set and the most used), we got to the point recently where we could rarely have matching napkins. Some of us would have the solid color set, I would have one of the two remaining Anthro ones, and the rest might have the blue flowers from my grandmother or the stiff plaid ones that were always delegated to the bottom of the stack. New cloth napkins went on my mental list, rather than on my Christmas list. So after Christmas, I returned to the predicament of how to go about buying new napkins. I thought about buying napkins from artisans overseas, but soon realized it would be out of my price range to buy the number of napkins I hoped to buy. The goal, other than to match and be soft, is not to have to dig through laundry baskets of unfolded clothes to find napkins for our breakfast today. A few days ago, I googled "cheap cloth napkins for kids" and found this blog post with a novel idea: to use shop rags for cloth napkins. They look great, are cheap, are made from cotton, and last for years, evidently. The lady who wrote the post said her first set lasted for four years with daily use. And when I say "set," I mean 25 napkins in a pack, for less than $10. That's exactly what we ordered, times three. I bought these Auto-Mechanic Shop Rags in white, blue, and green: 75 napkins in all for about $0.40 each. And now we're eating. And not digging through laundry for days. And wiping our mouths politely. And talking about how napkins can be squares and not rectangles. And thanking people who blog their good ideas. And thanking auto mechanics for needing shop rags. And placing pretty stacks of matching napkins in the bottom drawer. And writing blog posts ourselves about them.